I was trying to think of an alternative lemon cake recipe for an upcoming birthday, and remembered an episode of Paula Deen's show where she make Lemon Coconut Cake... Here is my adaptation of the delicious dessert. Preheat the oven to 350 degrees F. Grease three 9-inch round cake pans with butter, oil or cooking spray. To make the cake: Follow the directions on the cake mix box, substituting milk for water. Divide the batter among the cake pans. Bake for 20 minutes. Remove from the oven and let cool in the pans for 5 minutes on a wire rack, then remove the cakes from the pans to cool completely. In a medium bowl, stir together the sour cream, sugar and coconut. Spread between the slightly warm cake layers, piercing each layer with a toothpick as you stack them, but don’t pierce the top of the top layer. Store the cake in a container in the refrigerator for 2 to 3 days to allow the flavors to soak through. On the day you are ready to serve the cake, make the frosting: In the top of a double boiler, combine the egg whites, sugar, corn syrup or cream of tartar, and salt. Do not place over the heat; instead beat for 1 minute using a handheld electric mixer. Then place over simmering water and cook, beating constantly, until the frosting forms stiff peaks. This should take about 7 minutes. Remove from the heat. Add the vanilla and beat until it reaches spreading consistency, about 2 minutes. 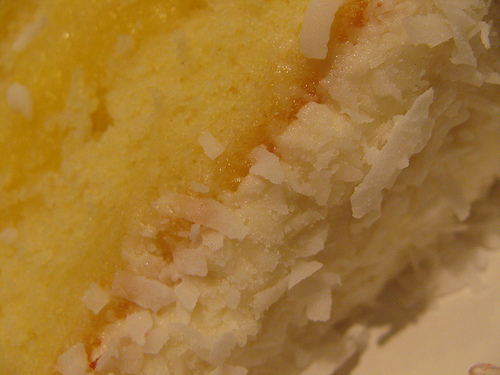 Frost the top and sides of the cake and sprinkle all over with shredded coconut. This is such a moist, tangy, deliciously coconutty treat. Thank you! You have taken two of my fave flavors and blended them into one delectable sounding dessert. Now I'm off to my kitchen to start baking!